This cumulative patch allows you to run THPS2 at a modern widescreen resolution in 32 bits color depth without FPS limit (locked at your display frequency). Additionally you can apply various fixes through the launcher. - rename THawk2_smaller.exe to THawk2.exe. You can either backup or delete the original exe. - second FMV after you beat Bullring level in career crashes the game. Either beat this level on vanilla exe, or rename vids folder, beat the game, save, then rename back. Everything below is optional and totally not required, but strongly recommended. Q: Launcher says exe is incorrect. A: You'll have to download "smaller" exe. Q: Game doesn't launch, log says something about sound device. A: THPS2 won't launch if you don't have at least 1 sound device enabled in your system. Q: Game crashes, log says something like "can't read/load file"
A: Make sure DATAPATH in th2_opt.cfg is correct. Often an issue when you moved game folder to a different location. Q: Game doesn't launch on Windows 10, throws 0xc0000022 error. A: This is an old DirectDraw game. You'll have to enable Legacy Component called Direct Play on our system. A: Most likely you don't have LevelPack and skater packs installed. A: The port is written in a way so it will close whenever graphic device is lost by application. Partially fixed by making it borderless windowed, but will still close on Ctrl-Alt-Del though. A: It was the issue prior v4prev2. Install latest version. Q: Game crashes after some videos. A: Known bug related to resolution patch code. You can avoid crashing by renaming/removing problematic videos. A: Unfortunately, you'll have to avoid problematic areas. Q: Some MHPB levels don't have rails and/or some parts of the level are not loaded. A: Unfortunately, this is the only way to load these levels at this point. Q: Some levels have missing/wrong sounds all over. A: New levels keep using THPS2 sound banks, hence some sounds may be missing or in a different order. A: Force vsync in your GPU driver utility. If that fails, use some 3rd party software to lock at 60fps like (MSI Afterburner). Last edited by Demo on Mon Jun 18, 2018 11:18 pm, edited 29 times in total. Well I guess you can just get smaller exe, since all the files are there in finkl version it should work. version 2, added options.ini. doesn't require to hang in background anymore. Works great! The only problem I have now is that border bug. Got a new computer a week or two ago and got th2 on it and now the border bug returned. Other than that, great job! Excellent work! Edit: Oh for fucks sakes. Its not working anymore. Goes into low res and then high res then closes. Bump. Not sure if anyone saw the edit above. It didn't really work too well with the Korean version. Everything 3d is huge and the game closes when I open a level. didn't test on finkl and french exe, those probably won't work. read dicussion with bailey in the video's comments section, if that helps. so the situation is it worked and then bam! doesnt work anymore? Demo wrote: so the situation is it worked and then bam! doesnt work anymore? I can run the v1 but the v2 is literraly unpossible! 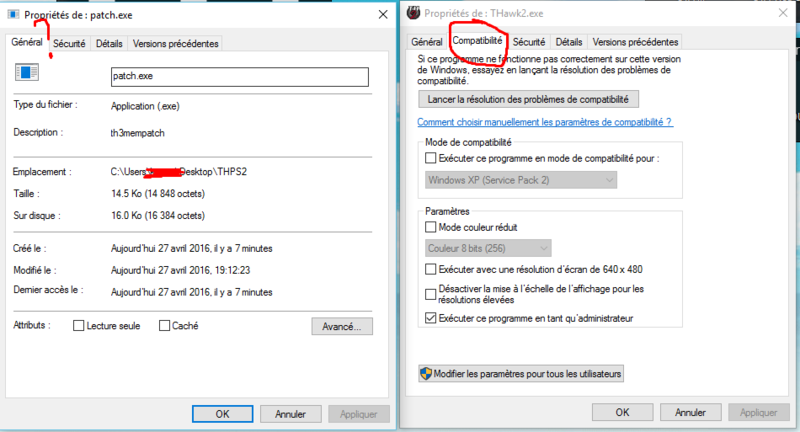 By the way, i just discovered that the french version is much more buggy on modern windows than the usa version. Last edited by Catar4x on Wed Apr 27, 2016 7:04 pm, edited 1 time in total. does it work without patch? just in case. you don't have to change anything on launch.bat since it's just a script to run game and patch at the same time. you'll have to apply admin rights on patch.exe and compativility on thawk2.exe if needed. in bat file try to reverse the lines so you launch patch first. it's just a text file, that you can edit. the difference is due to v1 needed to reside in your memory, if you'd close it, aspect ratio would mess up. v2 patches stuff once at the launch and closes, so you only have your game running. settings are in options.ini. Working without the patch yes. That's the problem, i can run launch.bat as admin, but patch.exe : this is unpossible to apply admin rights to it by default, the option is not available. That's probably why i can't use properly the patch v2.